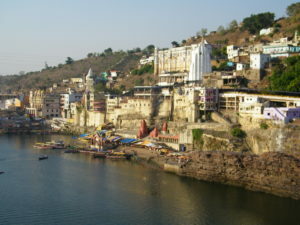 Omkareshwar in Madhya Pradesh on an island in the Narmada River is home to a Jyotirlinga shrine and the Mamaleshwar temple. It is on an island called Mandhata or Shivapuri in the Narmada river; the shape of the island is said to be like the ॐ symbol. There are two temples here, one to Omkareshwar (whose name means “Lord of Omkaara or the Lord of the Om Sound”) and one to Amareshwar (whose name means “Immortal lord” or “lord of the Immortals or Devas”). 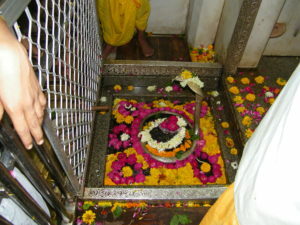 But as per the sloka on dwadash jyotirligam, Mamleshwar is the jyotirling, which is on other side of Narmada river.